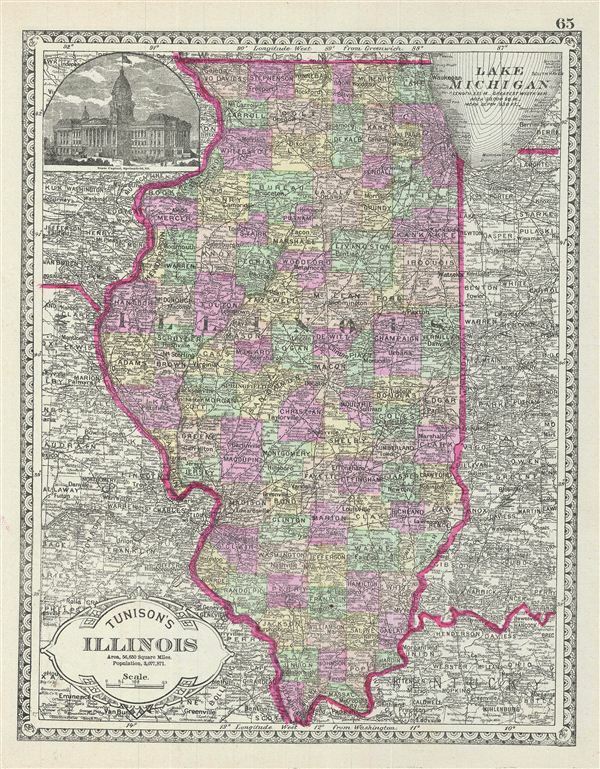 This is a beautiful example of the 1887 Tunison map of Illinois. It covers the entire state as well as portions of the adjacent states of Missouri, Kentucky and Indiana. The upper left quadrant contains a beautiful illustration of the State Capitol in Springfield. The map is highly detailed with color coding at county level. Various towns, cities, rivers, roads, and various other topographical details are noted. Published as plate no. 65 in Tunison's Peerless Universal Atlas. Henry Tunison (fl. c. 1886 – 1909) was a late 19th century American map publisher and businessman based in Illinois. Tunison published the Peerless Universal Atlas in various editions from 1886 to 1909. Unlike his competitors, the Rand McNally Company and George F. Cram, who printed low quality atlases using printed color, Tunison utilized old world publishing techniques and distinctively vivid hand color to drive the sales of his popular atlas. Because of this, Tunison’s maps, though late of period, remain desirable among collectors. Little is certain regarding Tunison’s early life; however, it may be one Henry Tunison whose family immigrated to Illinois from New Jersey in 1838. Tunison, H., Tunison's Peerless Universal Atlas (Jacksonville, Illinois) 1887. Very good. Map of Iowa on verso.